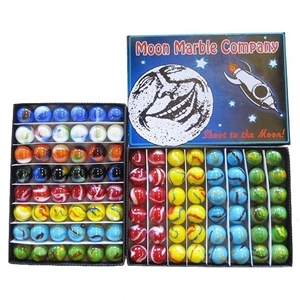 The Moon Marble Black Box holds 48 of the 5/8 inch diameter marbles. Choose to have single lines of styles, double lines, or an assortment of 48 different styles of marbles from the Vacor Factory in Guadalahara, MX. Marbles may vary slightly in size and color. Call in your order or make specification in the order notes if you would like to customize your marble choices. Warning! : Choking Hazard. This toy is a marble. Not for children under 5 years. Contains 8 styles: Blue Dolphin, Unicorn, Clownfish, Black Panther, Firefighter, Parrot, Serpent, Dragon. Contains 4 styles: Firefighter, Parrot, Serpent, Dragon. Contains 48 different styles. No two marbles are alike.